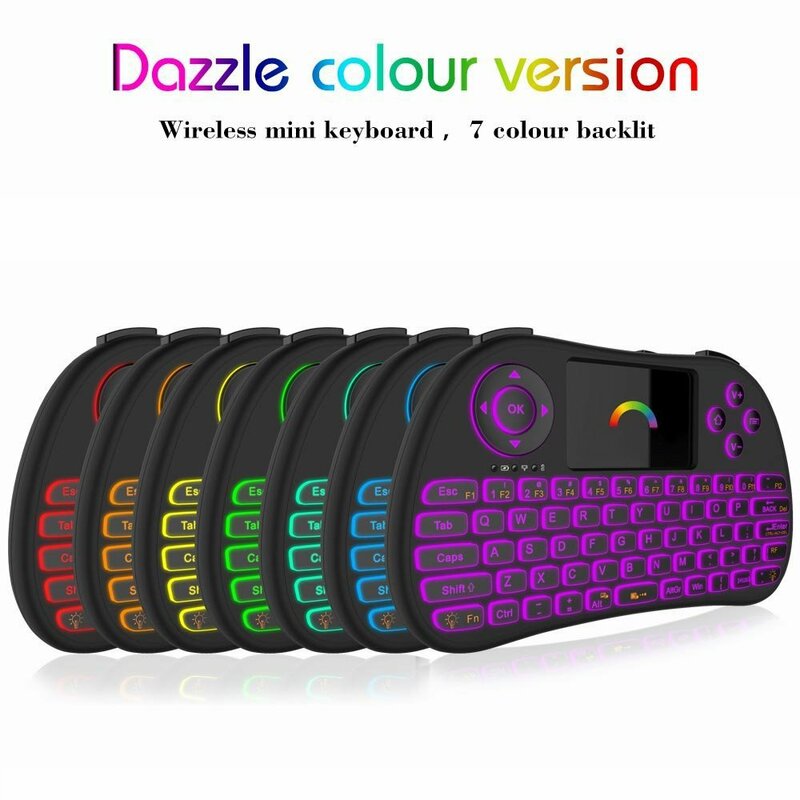 This is a wonderful combo, 2.4GHz colorful backlit mini wireless QWERTY keyboard and touchpad combo. 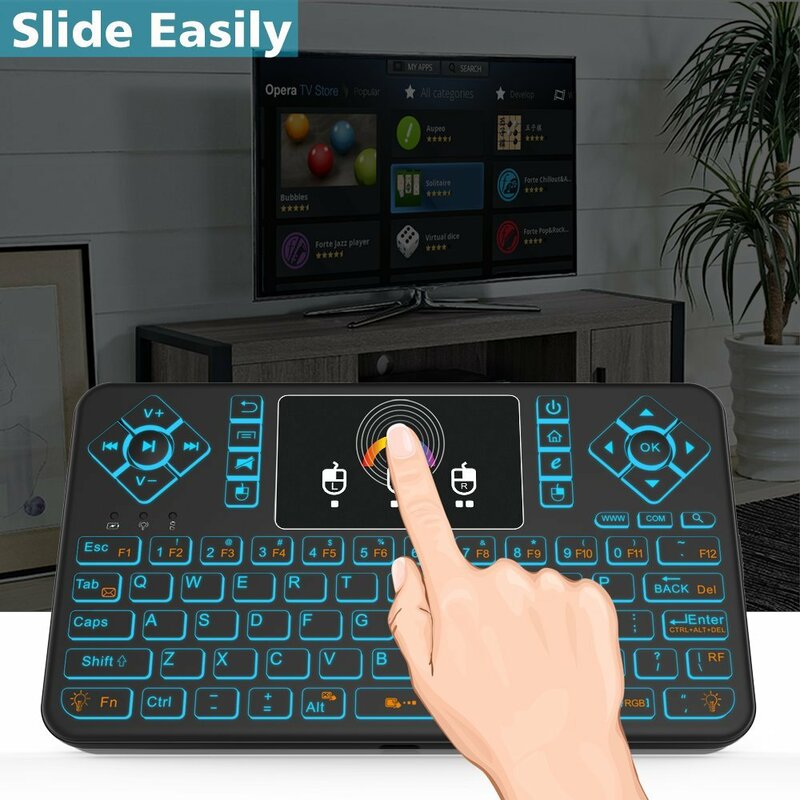 For people who want to watch internet TV play on their standard TV, they can sit in comfortable sofa and select viewing pleasure without walking to computer to change channels or scroll through options by using this handle keyboard remote.For the lecture, sales manager, presenter and others, who can conduct presentation and operate PC wirelessly from within a 30' radius . 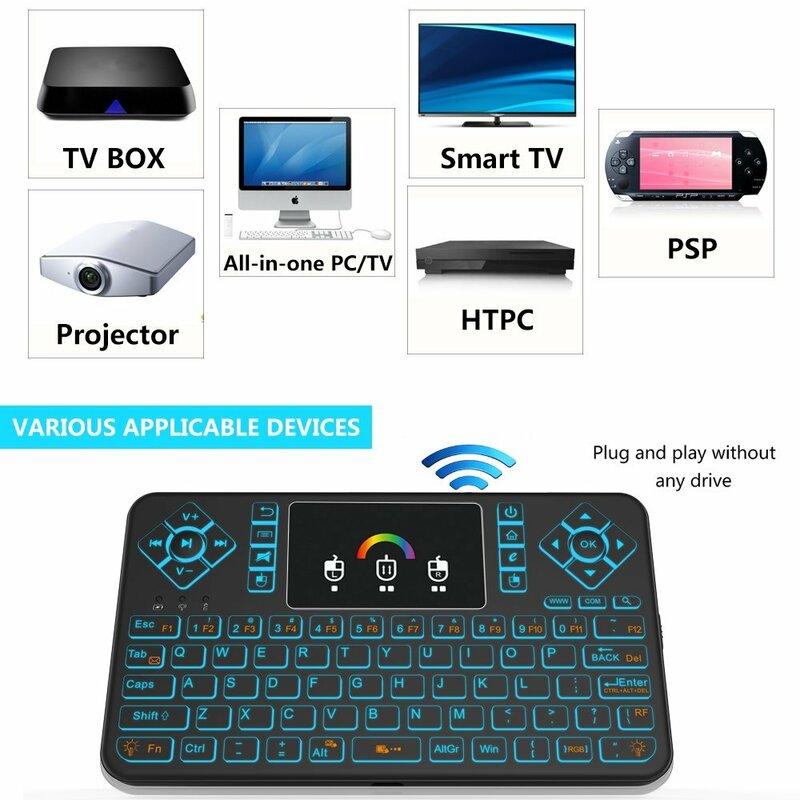 Perfect for PC, Pad, Android TV Box, Google TV Box, Xbox 360, PS3, HTPC, IPTV, etc. Backlit on/off: press Fn+Light Key(the key on the lower right corner). 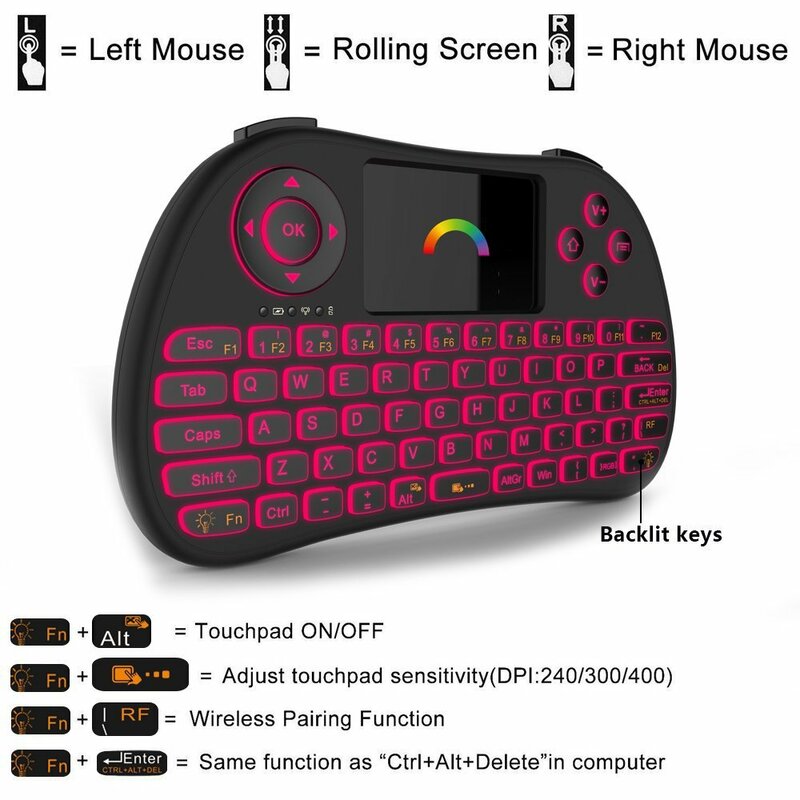 Adjust the color: turn on the backlit, press Fn & FGB,then slide on touchpad select the color. 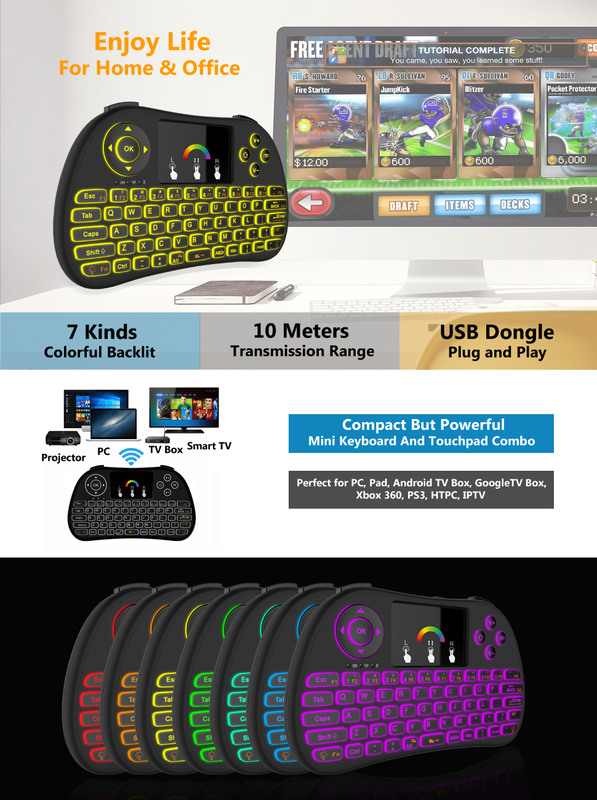 just got this mini keyboard. it is hanheld one with suitable size. The manual is not very clear. I just studied it with some days, .Finally I understand how to change the color. 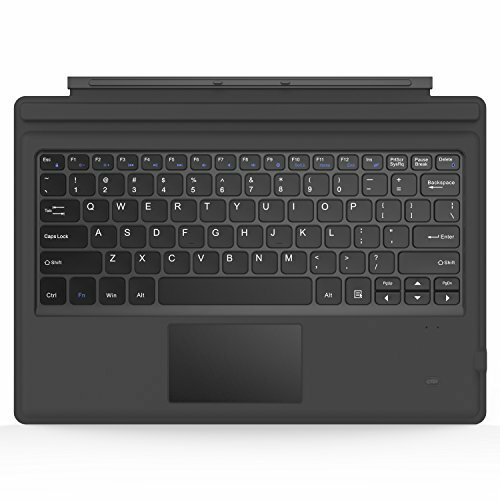 1. need to pree Fn+light key(right bottom, the last line) to turn on the backlit. 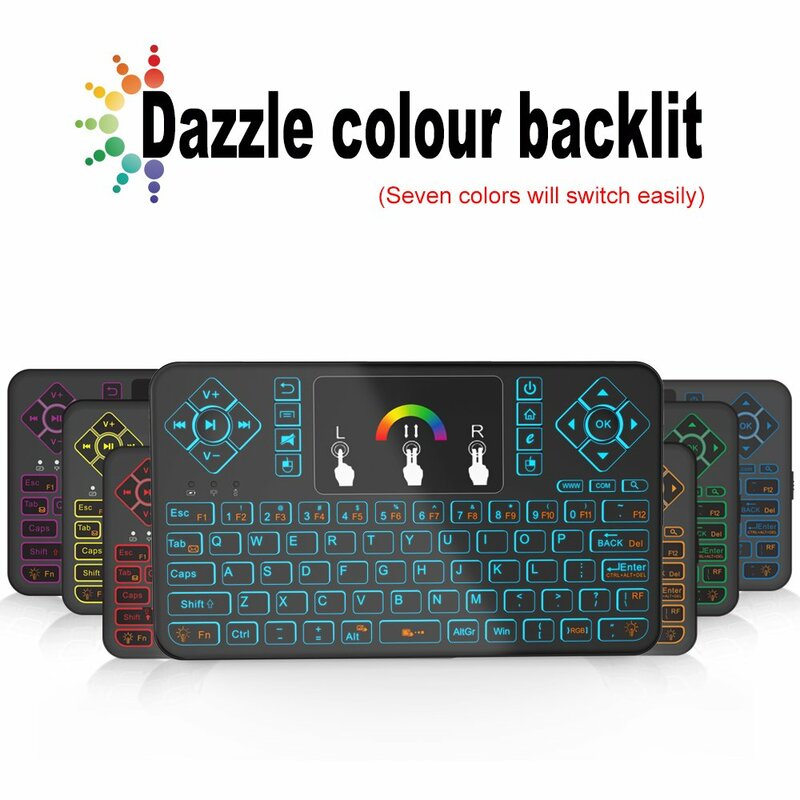 2. press Fn+ RGB to turn on the colorful backlit. 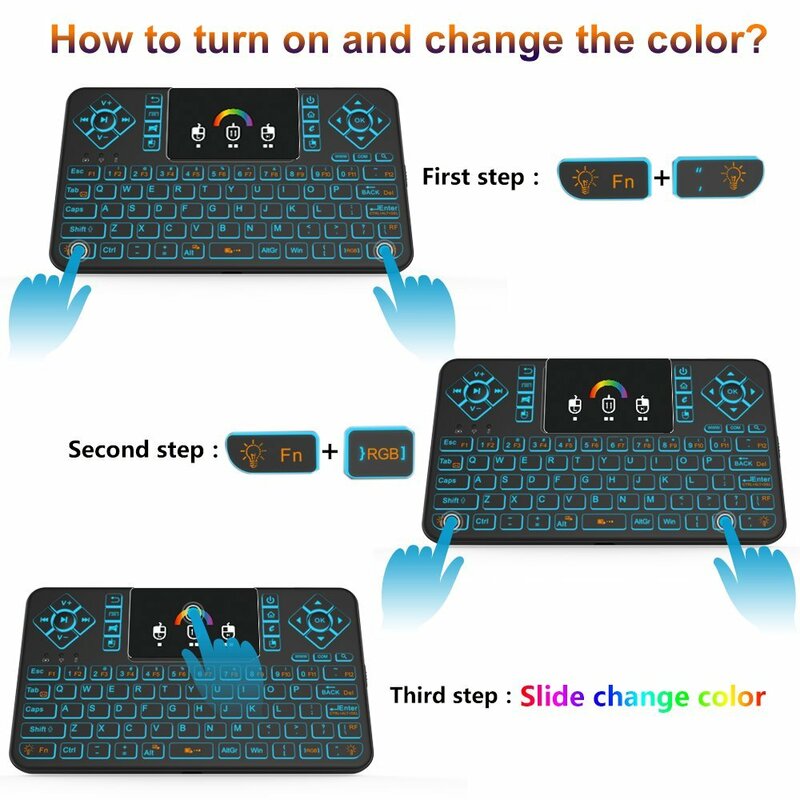 Then I can slide on the toupad to change the color. 3. 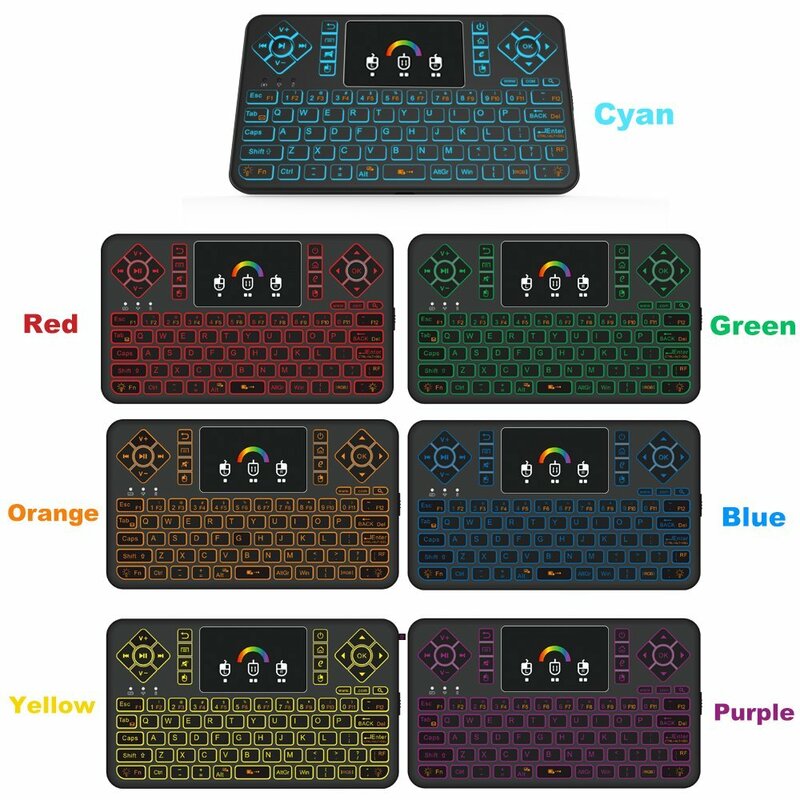 After I get the color I want I just stop slidding then the keyboard will rcord the color. 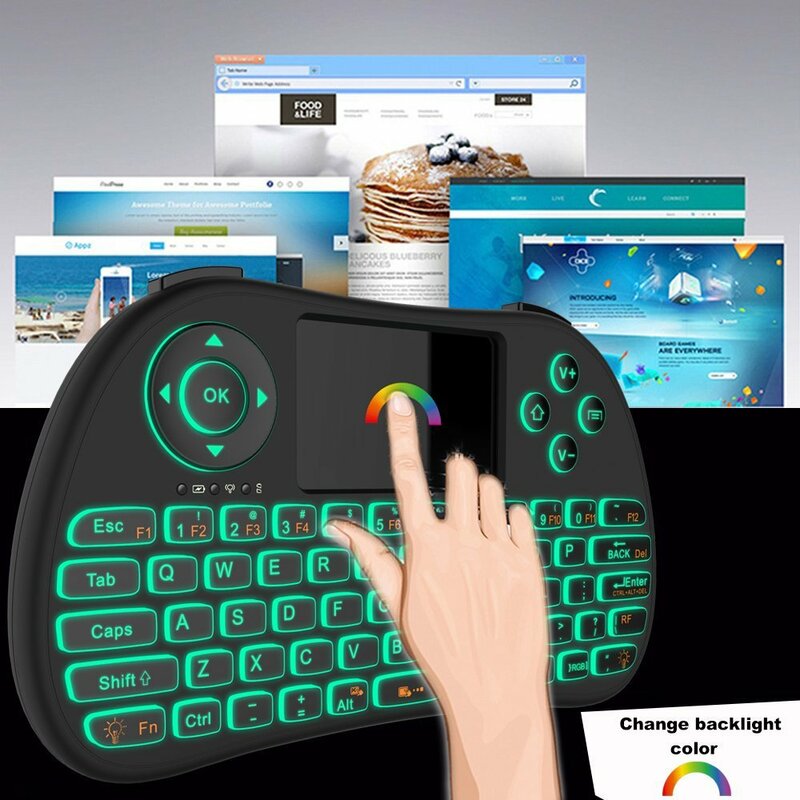 If you switch off the keyboard, the backlit color will be the same when you turn on the backlit again. 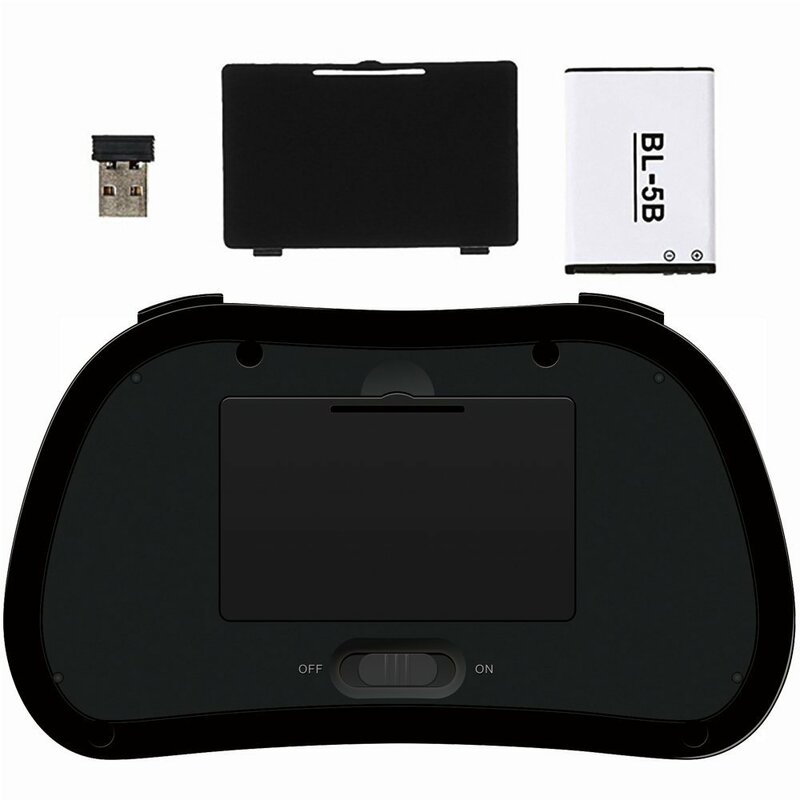 As the price is not expensive, I really recommend it. 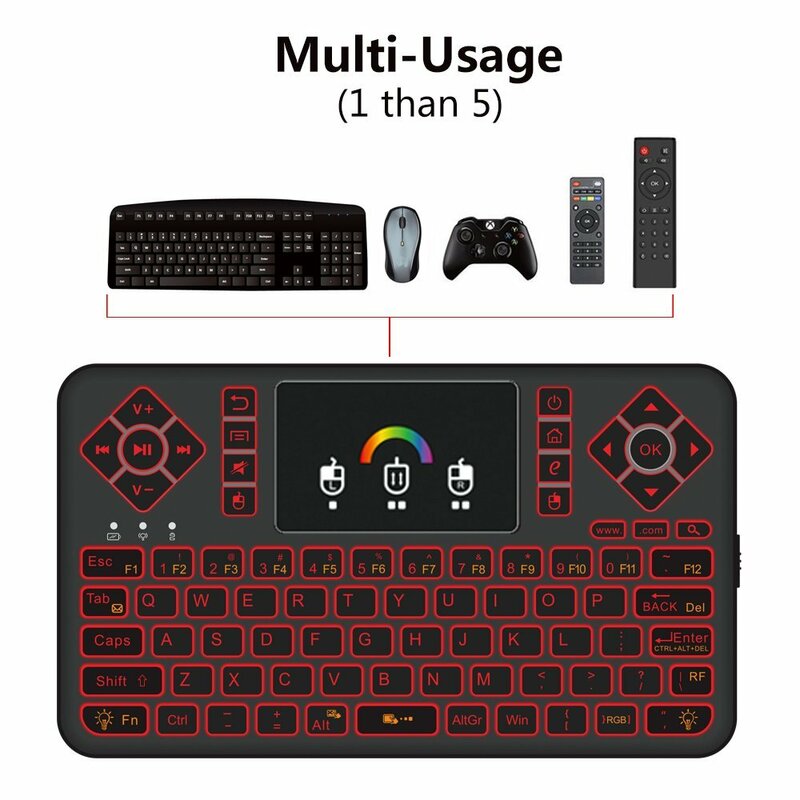 I can use it as the gaming keyboard, TV box remote or keyboard for my IPAd. 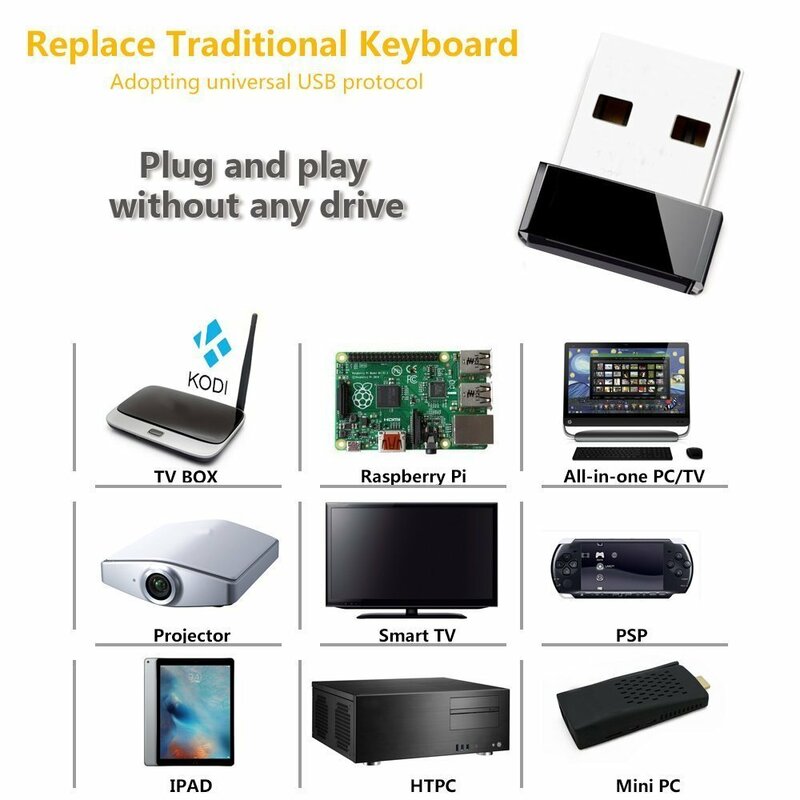 Of course I need to use a OTG adapter to plug the USB dongle. 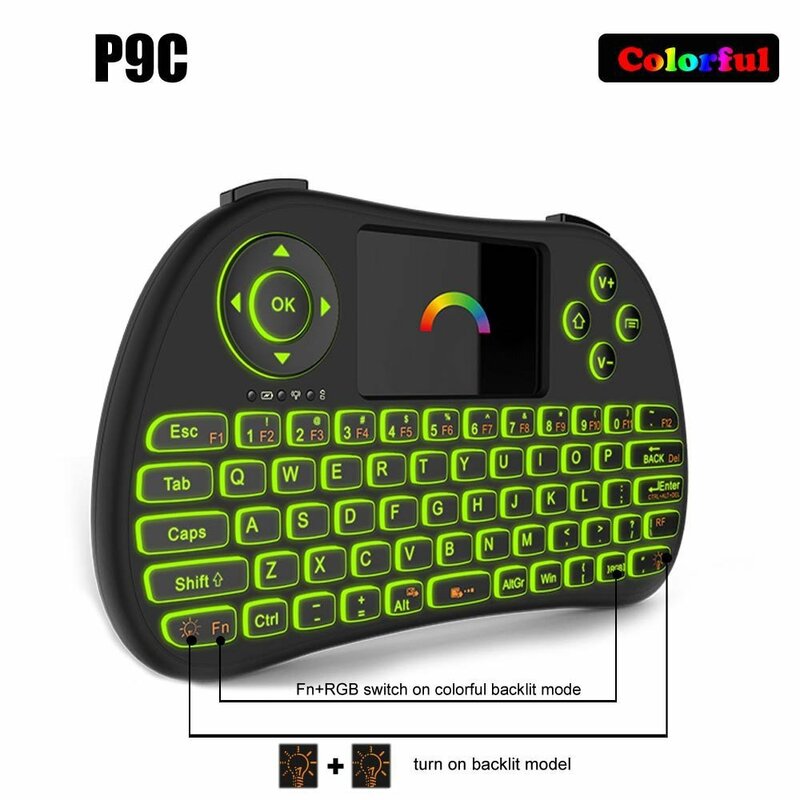 I purchased a T9 and this P9+ both are great keyboards This one seems more intuitive and if this had the ability to power off the remote device like the T9 then it would be the best keyboard out there. 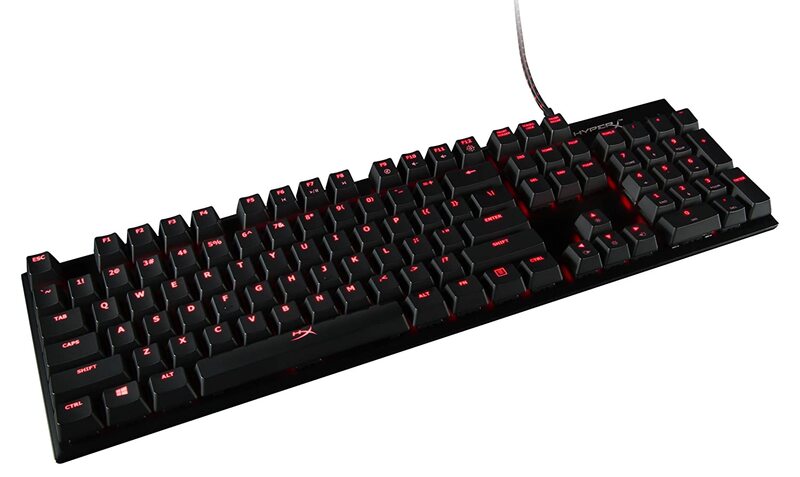 It is still the best value in a keyboard/mouse combo. 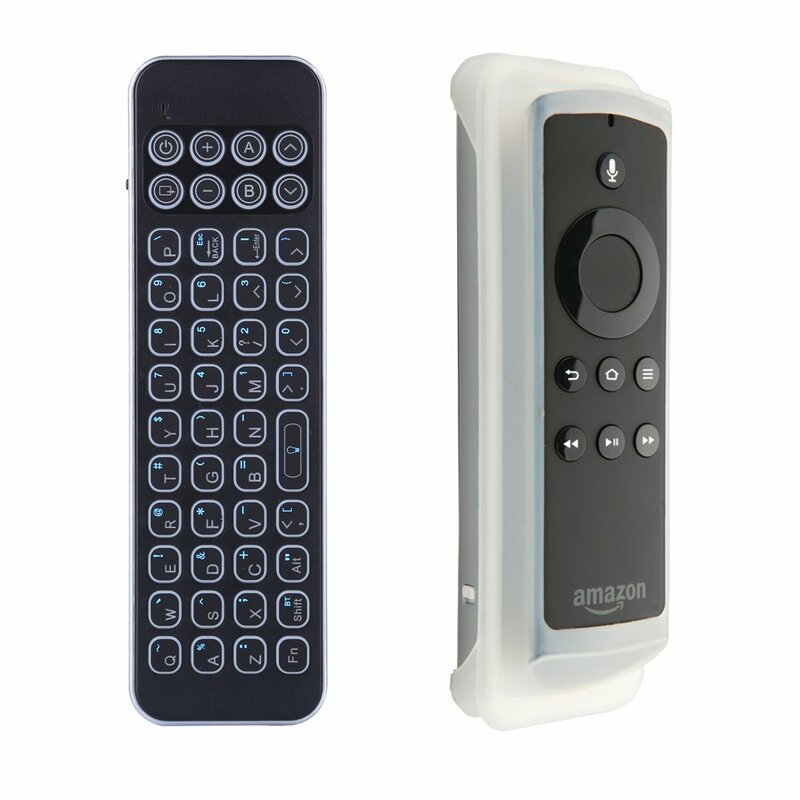 I have used air mice remotes also but for quick ergonomic simplicity you cant beat these keyboards. 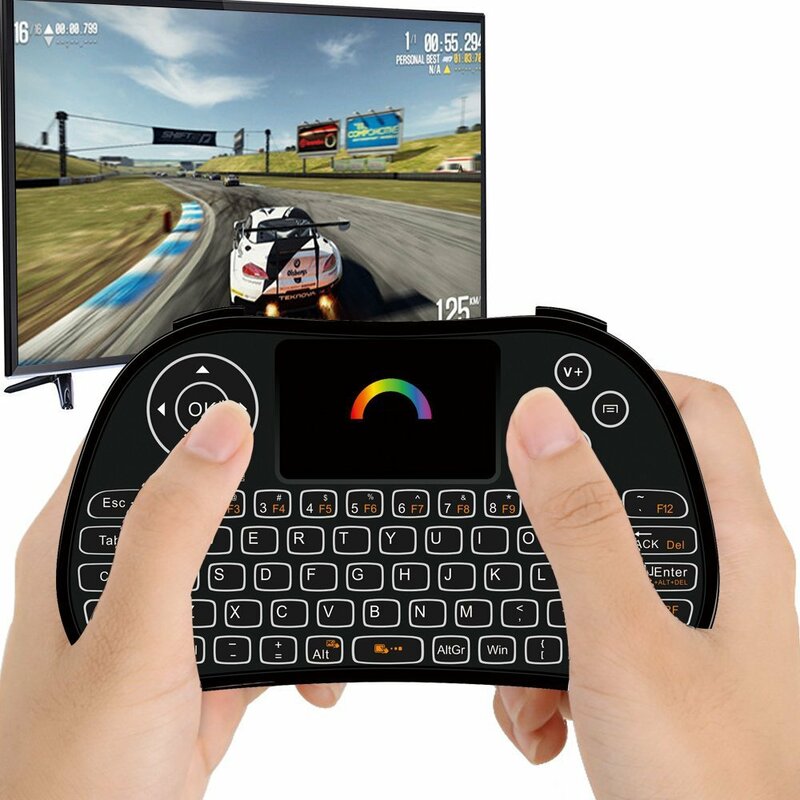 Works good with my android box. The back lighting feature is nice if your watching tv in a darker room. 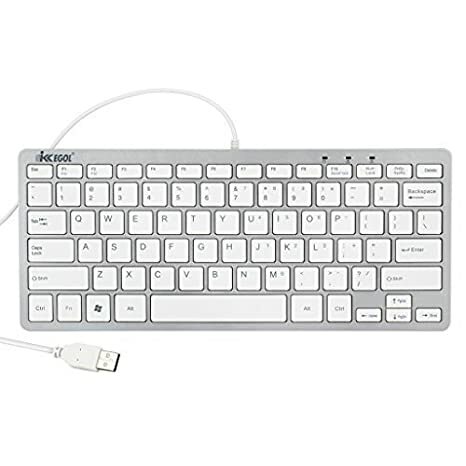 Makes it nicer to see all the keys. 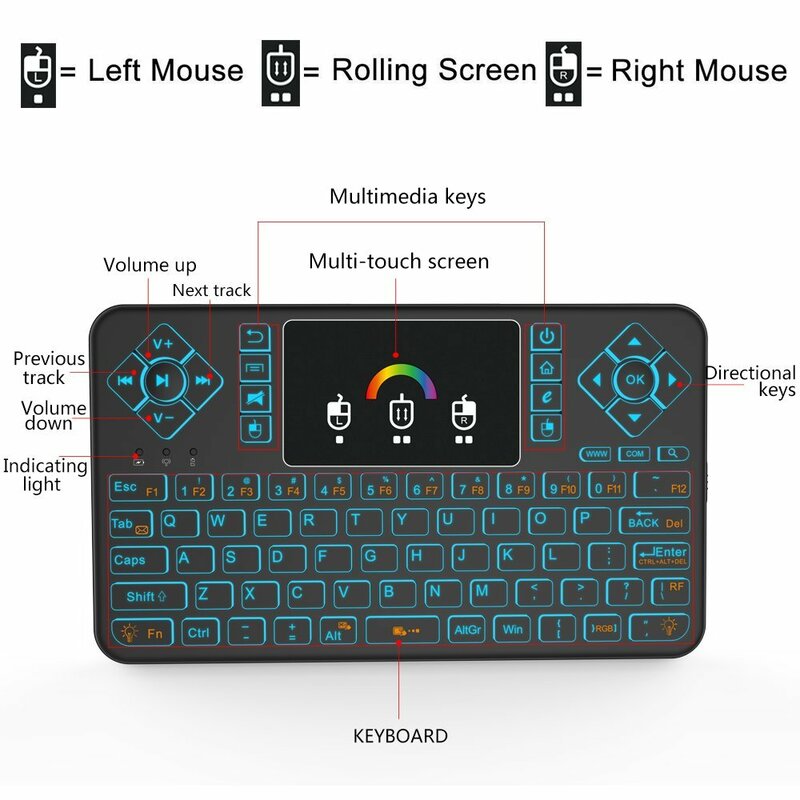 The only downfall is that it does not contain a page forward button like some of the other mini key boards that I have ordered. 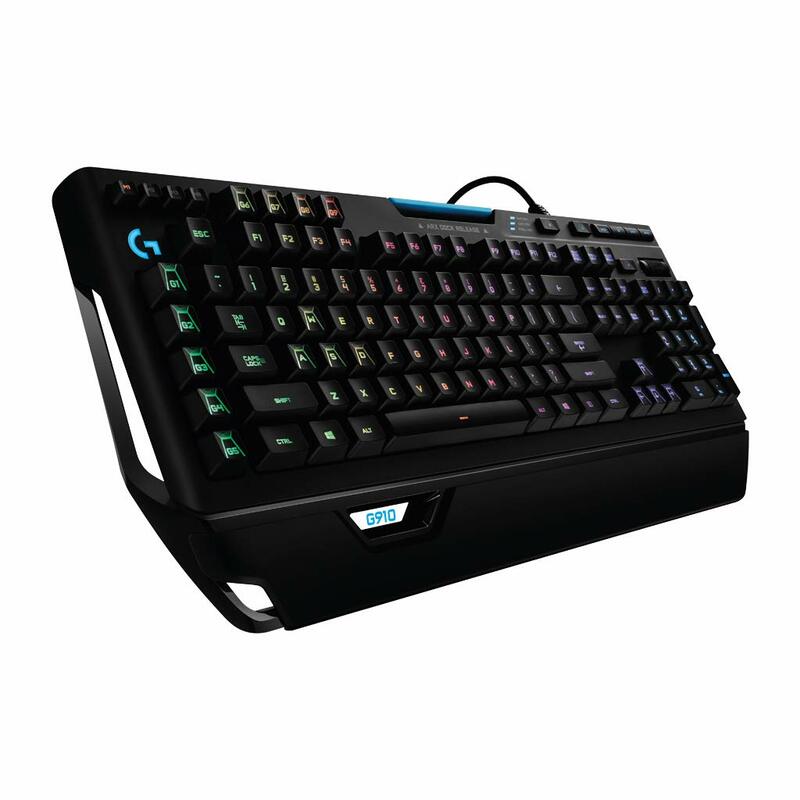 We liked this keyboard just the button issue wish it didn't have that issue. 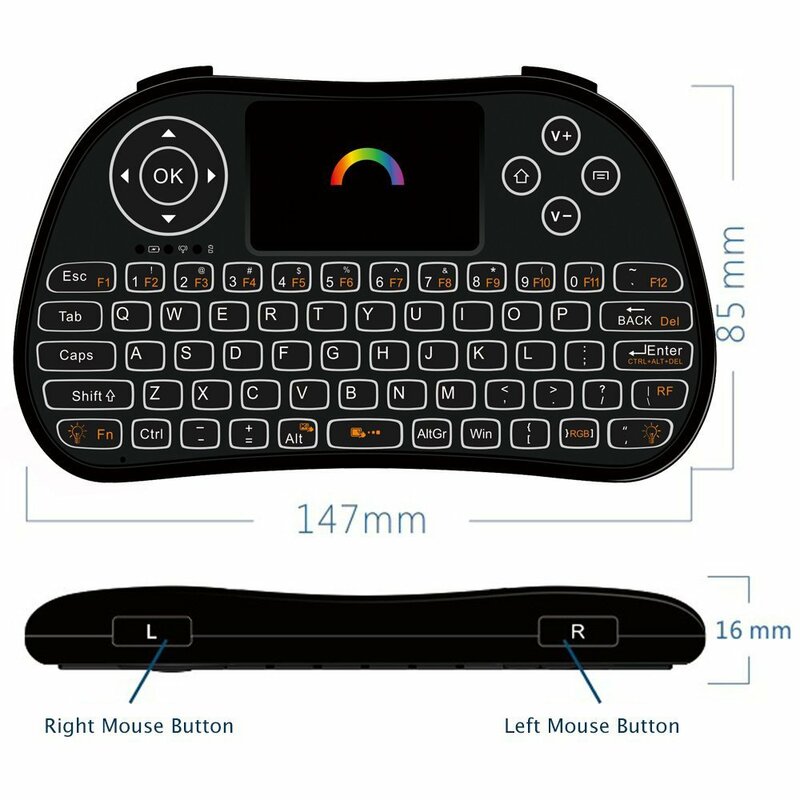 It was cheap material but still good looking device just too bad the main button was the one not working. Great product works well. As described. The only downside was the packaging smelled horrible like cigarette smoke. 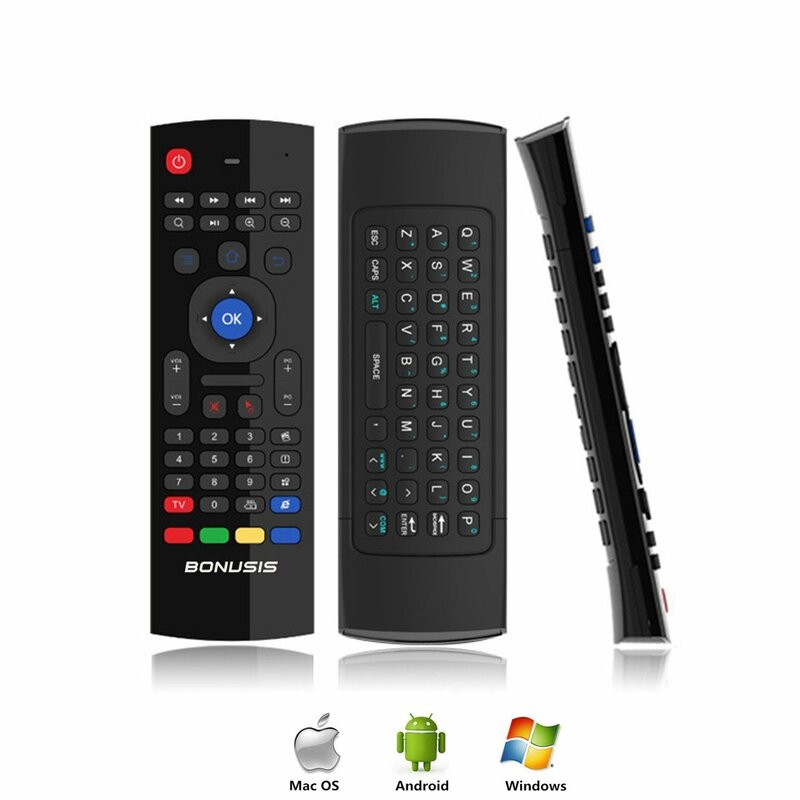 A must have for any android tv box, my stress level was pretty high after buying my first android box, dealing with the basic stock remote is a difficult task at times. 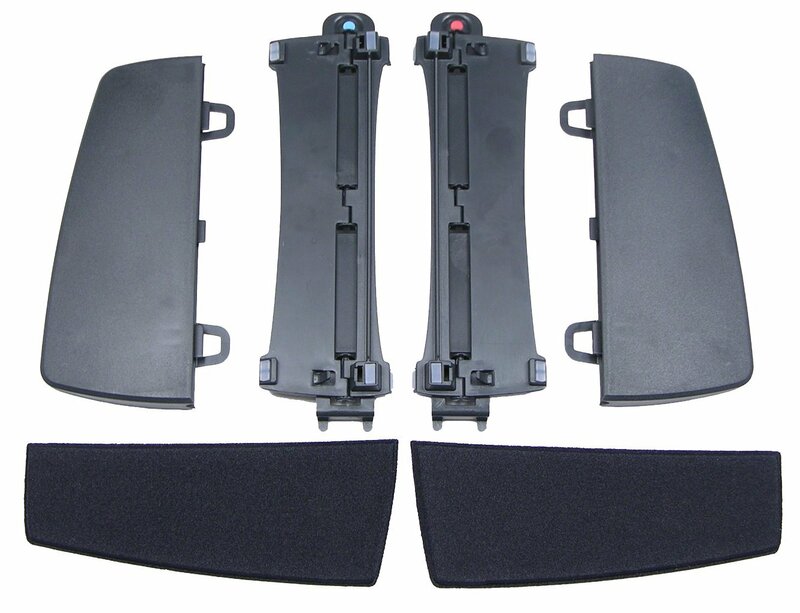 Good quality product.